While combing the villages and towns of Eastern Ghouta, Syrian Arab Army units on Monday found field hospitals, medical equipment, and tunnel networks left behind by terrorists. SANA’s correspondent in Eastern Ghouta said that army units uncovered two underground field hospitals connected by a tunnel extending for more than 400 meters in Erbin. The two hospitals contain stolen medical equipment and large quantities of medicine which the terrorists have stolen from the aid convoys that were sent to Eastern Ghouta under the supervision of the Syrian Arab Red Crescent (SARC). 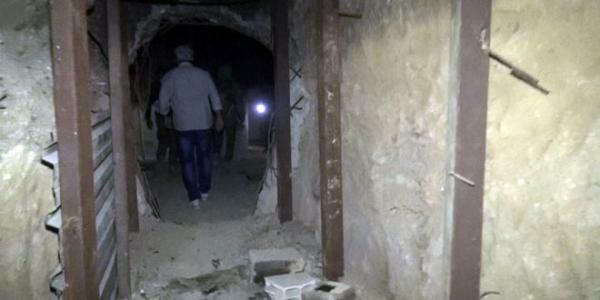 Army units also discovered a huge tunnel in Ein Tarma extending for a number of kilometers and dividing into two branches, the first connecting Ein Tarma with Zamalka in the north while the other connects the town with Jobar, the correspondent said, adding that terrorist groups affiliated to Jabhat al-Nusra and “Failaq al-Rahman” had been using this huge tunnel to sneak towards military posts in Harasta. Earlier, the correspondent said that the army uncovered a network of tunnels that include paths for cars, extending for around 3 kilometers and connecting Jobar, Erbin, Ein Tarma, and Zamalka.